One of the best things about living in Los Angeles is how close it is to the city that never sleeps, LAS VEGAS! My girlfriends and I L-O-V-E Vegas and find any excuse to make weekend trips to this infamous adult playground. It’s just a 4-hour sing-a-long drive while blasting our favorite girl power tunes and when we feel like traveling in style, a 45-minute plane ride sitting next to douchebags decked out in sparkly Ed Hardy shirts and traveling strippers—or even one time, a 5-hour disaster bus ride with 50 other girls being shuttled over by Steve Wynn’s staff to appear at Surrender Night Club’s opening weekend. Gotta love it. Ever since my cousins introduced me to this place on my 21st birthday, partying has never been the same. Once you party in Vegas, you can’t party anywhere else. So, why write about it? Because everyone who sees our “Whatever Happens in Vegas Ends Up on Facebook” photo album asks how the hell are we partying like rockstars?! I make a decent living being a bartender but let’s get real—I can’t afford to be sippin’ on $1,500 bottles of Ace of Spades champagne. The answer: IT’S VEGAS, BABY! This is the one place you can party and play like VIPs without actually being that important haha! My girlfriends and I put together a collaborative list of our best kept Sin City secrets that you and yours need to remember on your next escape to the big city. 1. The most important Vegas rule of them all: Go with friends you really trust. So many unexpected things can go down (we’ve all seen The Hangover) and when you’re heavily intoxicated, you want to be around girls you know have your back. Plus, for a less severe and more common reason, spending the weekend with women you know and trust means NO DRAMA. 3. Come with a budget & know you will lose it. Don’t worry, girls, the part about getting hooked up at a VIP table and getting free champagne showers all night is coming next– BUT Las Vegas is expensive. Women normally don’t have to pay for things at the day beaches or nightclubs but it’s a girls’ weekend and a perfect opportunity to treat yourself. So splurge on the high-end retailers at Caesar’s Palace or put $50 on red at the roulette table—you’re a baller for the weekend, remember? If you’re on a tight budget, stay away from Vegas. 4. Make nice with the staff. Day beaches and nightclubs are where the parties are at! No one in their 20s and 30s goes to Vegas for the gambling and shows. So the best way to be treated like VIPs is to become friends with the people who make it happen. TAO and XS are a couple of our favorite places and the most popular spots in the city, and we are lucky enough to have actual friends of ours working there. Part of their jobs as hosts, managers and bouncers are to get fun girls into their clubs. So come looking good, be friendly, and shmooze your way in. 5. ALL-GIRL CREW IS KEY. Waiting in lines is only for the guys who don’t buy bottle service and the girls who were lame enough to take their boyfriends to the club. Sounds obnoxious, I know. But who wants to wait in a 2-hour line and pay $50 to get in? I don’t! And you don’t have to either. Don’t be those people who wait outside forever to make the club look exclusive and busy. If you’re all girls (I mean, not even ONE guy) go up to the guys in the nice suits, and tell them nicely it’s just you and your 4 girlfriends tonight. They’ll take a few seconds to talk in their little secret headphones and gesture you to the front. A host will normally ask your group if you’d like to join a table of guys for drinks and usually it’s fun and harmless! You make small talk, pop bottles, toast glasses, and dance the night away. 6. For all my independent women, buy your OWN bottle service! Vegas isn’t fun without it! 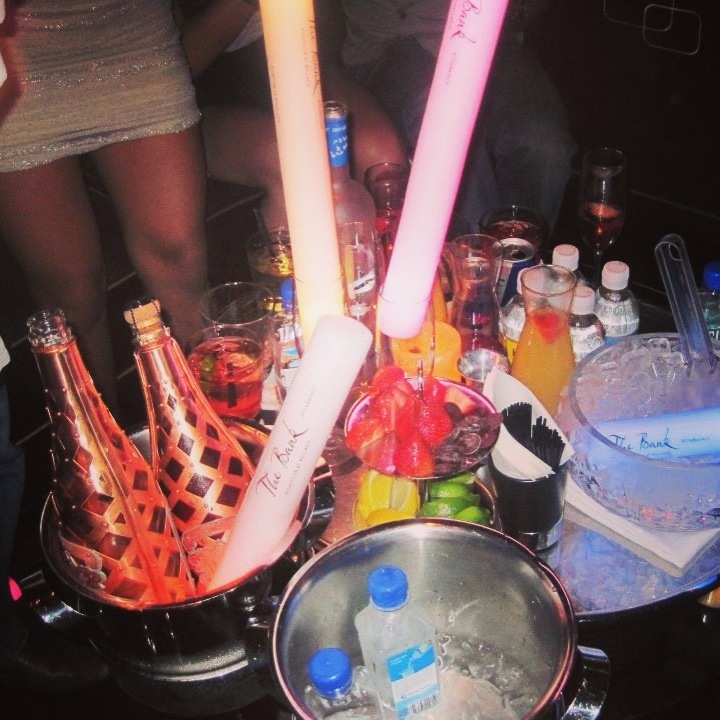 When we’re celebrating one of our birthdays or if we simply don’t feel like talking to guys, my girls and I buy our own table… but be ready to spend a pretty penny—one bottle of your favorite vodka and a private table in a Vegas nightclub is usually around $600-$900 PER BOTTLE. I’m not saying this is a SMART purchase in any way. It’s the epitome of a splurge and if you’re a hardworking group of gals, sometimes you do it just because you can. Boom. 7. DO NOT SLEEP WITH ANYONE IN VEGAS. Some people think this is actually the perfect place to sleep with randoms because “what happens here stays here”. Nothing makes me want to barf more than the thought of having a one-night stand with a complete stranger. People come to Vegas from everywhere in the world and you have no idea what kind of people they’ve slept with. I’m all about flirty fun when I’m single but I go back to my hotel room with my girlfriends and no one else—Every. Single. Time. I know most men have a different definition of a good Vegas trip but my version isn’t having a possibly STD-infested dude between the sheets. Vomit. 8. Stay away from the Las Vegas strip on Labor Day, New Year’s Eve, or any other big holidays. It’s not any more fun than other weekends, it’s annoyingly crowded and prices for hotels, club admission, and bottle service skyrocket. 9. LET LOOSE! Las Vegas is all about creating memories you’ll never forget—even if you almost want to forget them. Life is too short to not let your hair down and get wild sometimes. 10. This is NOT where you try and find a boyfriend. Guys in Vegas only have one thing on their minds—and it’s not gambling.